It was Day 3 of our Pennsylvania Wilds trip and this would be the most adventurous of them all. We set out for Warren, PA, about 45 minutes away. Located in the northwestern-most county of the Pennsylvania Wilds, this city is one of the largest population centers in the region and it’s flanked by the Allegheny National Forest & Surrounds Landscape. 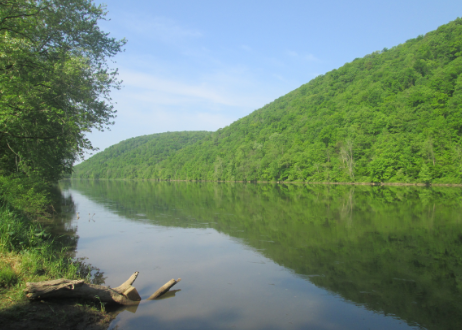 It also features the Allegheny River, one of two National Wild & Scenic Rivers in the Pennsylvania Wilds. This was one part of the trip we were especially eager to experience – a 16-mile overnight kayaking adventure. We weren’t sure how much to pack, so we erred on the side of caution and packed extremely light. One backpack was filled with our tent and another one filled with night clothes and next-day outfits for each of us, in addition to a couple dry bags containing small fleece blankets and some food/water. After packing everything into the kayaks we rented from AO, it was time to embark on the real part of the day’s journey. We paddled a beautiful section of the river, first passing the city of Warren and then remote islands and other natural areas. 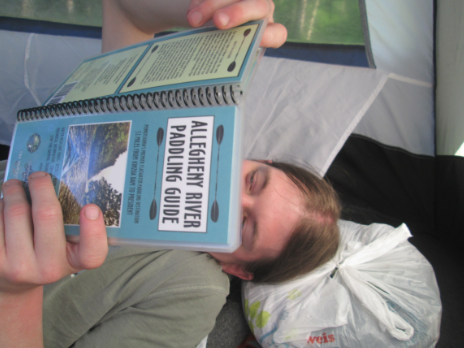 Utilizing the Allegheny River Paddling Guide developed by Piper VanOrd and Ta Enos, we were able to easily navigate the river and have a pretty good understanding of the key sites around us. About four hours after setting out from the livery, we ported at Crull’s Island, basically our mid-point on the journey. We set up camp, gathered some firewood so we’d have some evening light, and just enjoyed the serenity of nature. Some other paddlers passed by on occasion, but we’re relatively certain we had the island to ourselves that evening. We brought easy-to-open cans of soup and a small propane camping stove to make dinner, and also enjoyed some fruit and granola treats. Before it got dark, we put our remaining food items into a dry bag and strung them high up in a tree – hoping to prevent the temptation of an easy midnight snack for local bears. It was a chilly night, but we made it! The next morning we quietly packed our things up before pushing the kayaks back off the island for the second leg of our trip. It was a beautiful, quiet morning with perfect paddling weather. Along the journey we saw blue heron, Canada geese and mergansers. A few hours passed quickly as we pulled in to the marked end of the journey at Wildwood. We were pleasantly surprised. And super proud of the success of our first overnight kayaking adventure. It was a one-of-a-kind experience, and one that I will never forget. The AO staff promptly picked us up and delivered us back to our car at the livery. And before we knew it, it was on to Day 4.